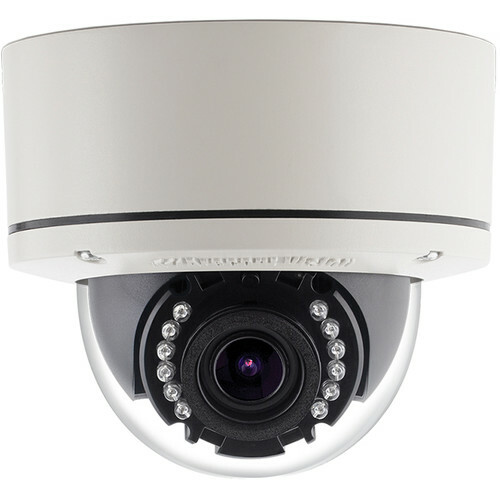 Capture 1920 x 1080 video at 30 fps and zoom in on details with the MegaDome G3 AV2356PMIR-S 1080p Outdoor Network Dome Camera from Arecont Vision. Designed for use both indoors and outdoors, this all-in-one solution integrates a 2.1MP sensor. SNAPstream (Smart Noise Adaptation and Processing) technology and H.264/MJPEG compression reduce bandwidth use without impacting image quality. Designed to be easy to install and manage, the MegaDome G3 AV2356PMIR-S uses an IR corrected, motorized P-iris varifocal lens with remote focus and zoom capabilities. An SD card slot supports up to 32GB of local storage. The installer-friendly housing is not only IP66 rated for use outdoors, but also IK10 vandal resistant for deployment in high-risk locations. Included in the package are a software CD, connection cables, and mounting hardware.